Mary Beth: It was a year ago that I got serious about beekeeping; I had just put in my order for a package of honeybees and I was so excited. But I really had no clue about what I was getting myself into (neither did my husband!). Sure I’d read a lot and spent countless hours learning as much as could, trying get a feel for what it was going to be like. And you newbies will do the same thing. 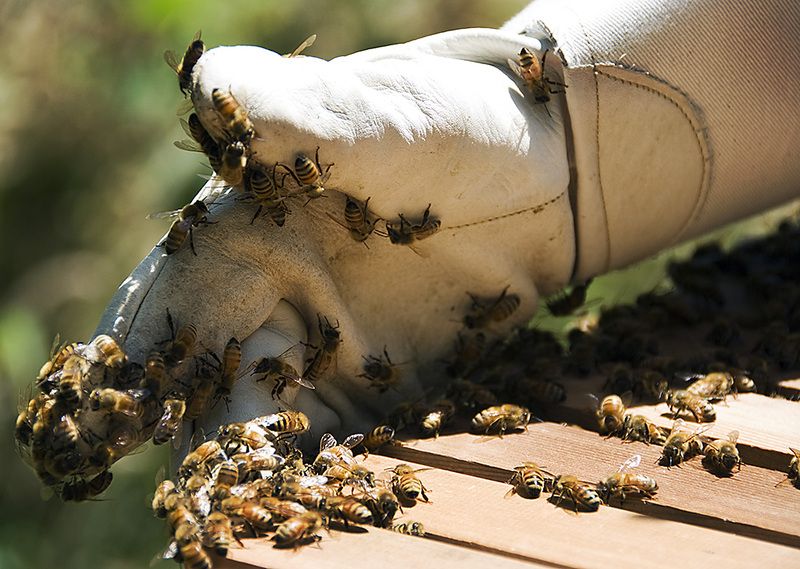 Be forewarned though, all the research is very helpful, but beekeeping is really a hands-on kind of thing. 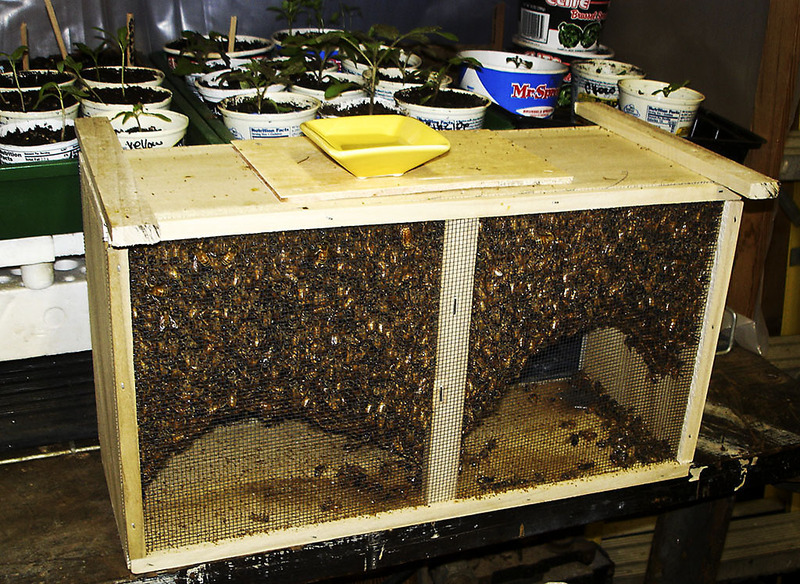 No amount of research is going prepare you for the rush you’ll get when you see them for real in their screened box, or when you dump them in their new hive, or when they start to build the first honeycomb, or… I could go on and on. As I went through this first year of learning to be a beekeeper, I kept reminding myself to make note of the important things I wanted to pass on to those of you who are thinking of getting your own hives — you’re going to make mistakes, you’re going to get stung, and there will be times when you’re going to feel seriously overwhelmed. But you are going to love those bees! Here are more tips and some words of encouragement to all the newbies scrambling to get every piece of information you can before your bees arrive. 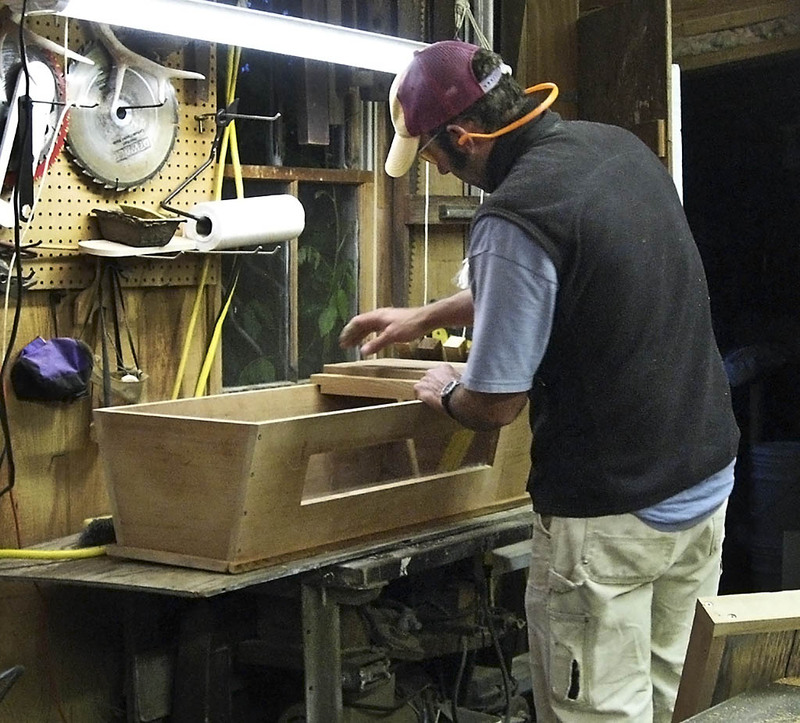 Consider a Top Bar Hive, you’ll spend a lot less time and money preparing for your bees. Did I say a lot more money?! I cringe at what I could have saved if I’d known at the beginning what I know now about the TBH. Have your hive set up before the bees arrive. The hive entrance should be facing the south to southeast if you can. Bees will fly into and out of the hive in the direction that the entrance is facing, so make sure the bee flight path is directed away from sidewalks, streets, etc. If you have to deal with close neighbors or walkways, etc., place a fence or a barrier a few feet away from the hive entrance. That will make the bees fly upwards and out of harm’s way. Spray the right amount sugar water on your bees before dumping them into the hive. It’s not a soaking spray, but it should be enough that they will be too busy licking themselves off to start swarming around your face and distracting you as you get them into their new hive. Use your protective gear. I tried not using any protective gear that first day. Although the bees weren’t aggressive — they didn’t have anything to protect yet — I got so nervous when I was dumping them into the hive that I had to stop what I was doing to run for my suit. The whole operation would have been much smoother if I hadn’t been so worried about getting stung. If you’re using a smoker don’t rush preparing it. It’ll take 20-30 minutes to get it going and to have a decent amount of coals to get you through your inspections. There’s nothing worse than seeing the girls lining up to take a shot at you and finding that your smoker is out. When it’s time to inspect the hive, think about what you’re going to be looking for BEFORE you open up the hive. Are you saying, “DUH, Mary Beth!”, right now? Well maybe, but I was often so fascinated, distracted, or rushed to get things done that I didn’t remember to check for important signs during the inspection. Write it down so you’ll remember. I stressed myself a few times, realizing after I’d closed the lid that there was something I forgot to do and you really don’t want to have to go back in again. It’s not good for you or the bees. The most important thing to remember as you do your research is an old saying that goes, “Ask 10 beekeepers the same question and you’ll get 11 different answers.” Keep in mind that every region has different challenges be it pests, weather, nectar flow, or any number of other things. Your best bet is to absorb all the information you read and then use your best judgement and follow your gut. That’s the way to make sure you’re doing your best for the bees. A lot of this information, plus pictures illustrating the process from building the hives to installing the bees and more, is in earlier posts on this blog, along with some great resources that I found very useful. One thing I know for sure is that you are going to really enjoy this journey. Good luck and, please, if you have any questions, just ask. I would love to help you out. I checked on the bees through the TBH window and found it was warm enough today for them to break cluster. I also noticed they still had food left. They were feeding and roaming around slowly, and a few were taking a cleansing flight. I was happy to see that there seemed to be quite a few bees in the hive. I went inside feeling very hopeful that they will survive this cold winter! You’re welcome for the tips and thanks for visiting our blog. We don’t have any animals on Block Island that will bother the hives, so that wasn’t an issue for me. 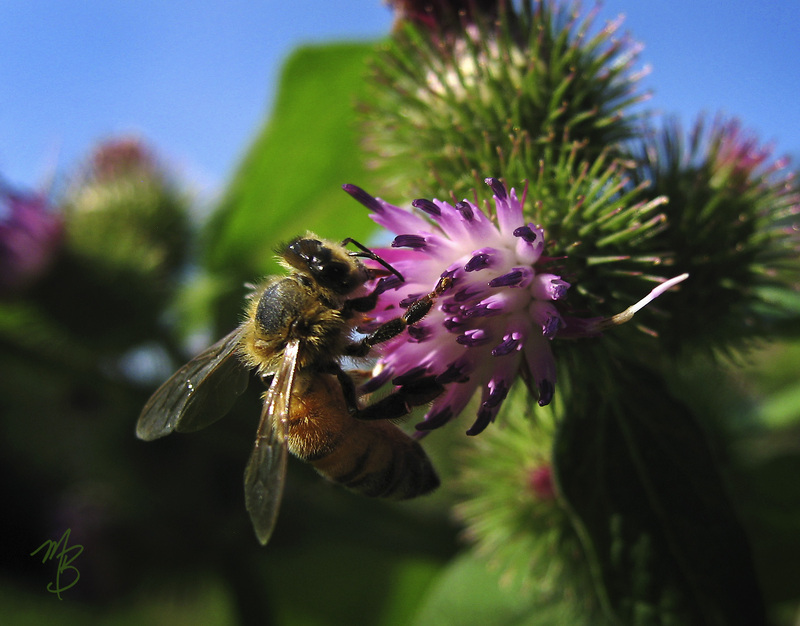 The bee school you are going to attend will most likely address pests in your area. I didn’t take any honey from the hive this year because I wanted the bees to have enough to get through the winter. But from what I’ve read it doesn’t seem to be any more difficult to remove honey from the TBH; you remove a comb, cut it off the bar, crush it and drain the honey. TBH’s produce less honey than the Langstroth hives generally, so if you want a lot of honey then go with the Langstroth Hive. Here is a good post from another beekeeper who does a good job explaining Top Bar Hives vs. Langstroth hive. http://www.dukecityfix.com/group/urbanbeekeepers/forum/topics/topbar-hives-vs-standard. Hope this helps and good luck. Great tips – I have also always preferred the top bar hives. Also, spot on about the saying “Ask 10 beekeepers the same question and you’ll get 11 different answers.” This is why it is so important to join a local group. Great post – thanks for all the great tips and fantastic pictures. Top bar hives have some real advantages, but one drawback is that you will get less honey from a TBH than from a standard Langstroth hive. I guess it just depends on what you want to get out of keeping bees – honey is only one of the many rewards of beekeeping. Re: your comment about the cost of a TBH, I didn’t understand – are you saying it is *more* expensive for TBH vs. Langstroth? I always thougth it was less. I run 2 LL hives. I just discovered your blog – I’m adding you to my reading list! I found the TBH to be much less expensive. Wow, I wish I would have discovered your blog about 6 mos. ago when I got my first hive. It would have been so helpful. You’re right, most of what I’ve learned is by doing and making some mistakes. So far the girls and I are all surviving. I’m going to be following your blog and I appreciate all the great information you share. Keep it coming. Thanks. Glad you found our site and found the bee posts helpful. Great Information, thank you ! I’m wondering- how do you protect the hive from ants-with that sugar water and their eventual honey? We have ant issues, here . I so far have﻿ used cans of water and oil at the feet of the tables-but ants still seem to be a problem- especially for the young hives. I was having some problems with ants as well and it was an ongoing battle! I tried cayenne pepper and cinnamon sprinkled around the base of the hive, didn’t work for me and then I tried spraying Citrus Magic Air Freshener on the legs of the hive, that seemed to help. I read ants don’t like orange peel oil . I just started beekeeping myself last year. And these are all great tips. Have any tips for keeping bears away?